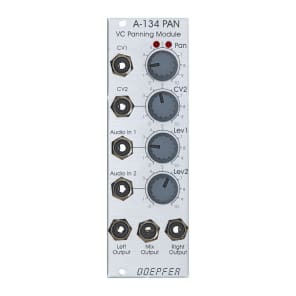 A-134 is a voltage controlled universal panning and/or crossfader module. If the module is used a voltage controlled Panning device one audio signal is panned to two different outputs. If the module is used a voltage controlled Crossfader two audio signals are mixed to one common output. The module enables even compositions of both functions. The module contains two linear high quality VCAs (made with CEM3381). VCA2 works in the opposite direction of VCA1 i.e. the more VCA1's loudness increases the more VCA2's loudness decreases. The panning or crossfading is adjusted with a control knob (manual control) and by two external control voltages, one equipped with an attenuator. Suitable control voltage sources are e.g. LFOs (A-145, A-146, A-147), envelope signals (A-140, A-141, A-142, A-119), random (A-118), Theremin (A-178) or a voltage coming from an MIDI-to-CV-Interface (A-190, A-191). The panning/crossfading is displayed with 2 LEDs. A-134 has an audio input with attenuator for each VCA. If the audio input of VCA2 is not used the audio input of VCA1 is connected with audio in of VCA 2, i.e. the sockets are "normalled". The module has three audio outputs: Left Output (VCA1), Right Output ( VCA2) and Mix. For Panning applications the outputs Left Out and Right Out are used. 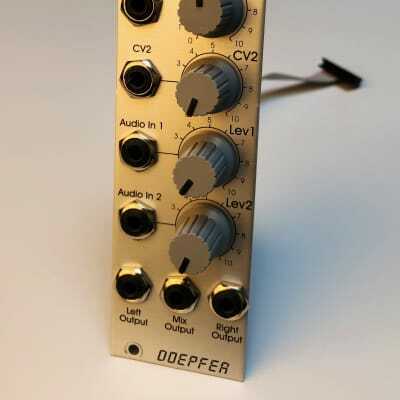 If the module is used as as Crossfader the Mix Output functions as output. Module A-134 enables voltage controlled stereophonic panning effects (one audio signal distributed to two outputs), crossfading effects (two audio inputs mixed to one audio output with voltage controlled loudness proportion) and combinations of both effects. For more detailed information please look at the English user's manual. Version 1 of module A-134-1 is able to process only audio signals. It cannot be used to process slowly varying control voltages as the in/ouputs are AC coupled. Version 1 has been manufactured until about April 2013 and can be identified by the CEM3381 VCA circuit (8 pin circuit labelled CEM3381 or PA381). Version 2 of module A-134-1 is able to process even slowly varying control voltages as the in/ouputs are DC coupled. Version 2 is manufactured from about May 2013 and can be identified by the SSM2164 VCA circuit (16 pin circuit labelled SSM2164 or V2164).